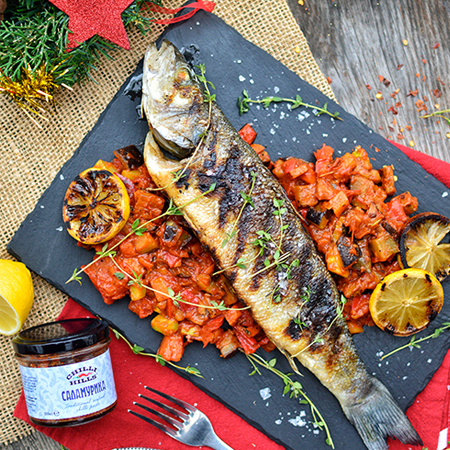 There is an unique Saint Nicholas Day`s recipe with fish and its best friend – Salamurika paste. Pour olive oil on the sea bass, add salt and black pepper. Cook it in grilled saucepan, highly heated so that fish could not stick in. Cook it for 7 minutes, each side. The Ratatouille needs a deeper saucepan, starting with garlic and onions. After 2-3 minutes add the carrots and peppers. After 2 minutes add the zucchini and aubergine. Now put a table spoon of Salamurika and stir everything. Now you can add the tomatoes and tomato puree. Stir and add some salt, black pepper and thyme. Leave for 3-4 minutes until ready. Serve and enjoy your meal!